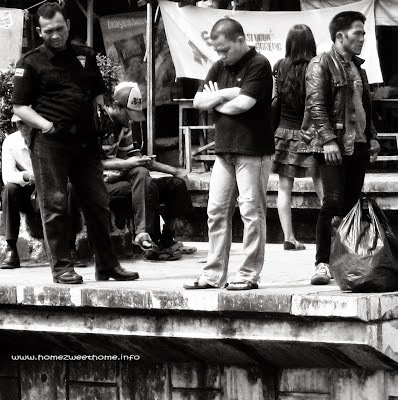 This candid shot was taken at the Bogor Railway Station in 2011. I captured it from inside a train. Those three men were waiting for different train. From their face expressions, I guessed that they started to feel bored. Waiting is never easy and fun. Well taken. I love street photography like this. These guys certainly look as if they are lost in boredom. Interesting scene. I get the impression that one would like to leap from a tall building.